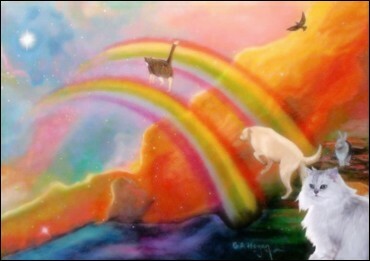 Written somewhere in the last decades of the twentieth century, "The Rainbow Bridge" is a poem that depicts a place where animal companions go upon death. It is located right at Heaven's entrance and there the pet is cured of any pains from its life before. Happily it lives there with the companionship of other pets as it waits to be reunited with its human guardian when he or she finally arrives at Heaven's gates as well. Together they then cross the bridge and enter together. Many animal lovers who have lost a pet know and have come to know about this poem. It has been spread across the world and has no certain origin as to who the author is. Nevertheless, the poem has brought great comfort and hope to those who deeply need it in their time of mourning their beloved animal companions and will certainly continue to do so as long as there is need. Original picture: "Rainbow Bridge" by Gail Hogan. Edited by Nyxity Lee to include picture of Peabody. The Rainbow Bridge ~ Author Unknown.